In a normal spin, the wing on the inside of the turn is stalled while the outside wing remains partially flying and developing some lift. It is possible for both wings to be stalled but the angle of attack of each wing, and consequently its lift and drag will be different. Either situation causes the aircraft to rotate toward the stalled wing due to its higher drag and loss of lift. 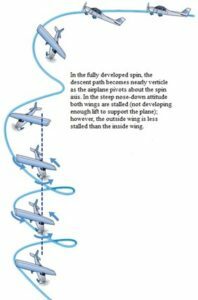 A spin results from a wing stall that results in a downward rotation of the aircraft toward the ground. Spins can be entered intentionally or unintentionally, from any flight attitude if the aircraft has sufficient yaw at the instant of wing stall. 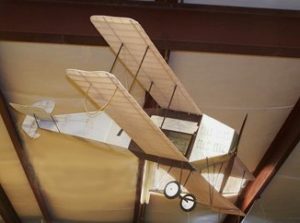 The Avro Type G narrative describes the aircraft as being the first aircraft to recover from a spin in front of witnesses. What exactly is an aircraft “spin?” The use of the rudder at the point of stall may also be used to intentionally determine in which direction the aircraft will rotate during the spin. Spins are characterized by a high angle of attack and/or low airspeed. A spin differs from a spiral dive in which neither wing is stalled and is characterized by a low angle of attack and high airspeed. A spiral dive is not a spin because neither wing is stalled. In a spiral dive, the aircraft responds conventionally to the pilot’s inputs from the flight controls and a spiral dive requires a different set of actions from the pilot.